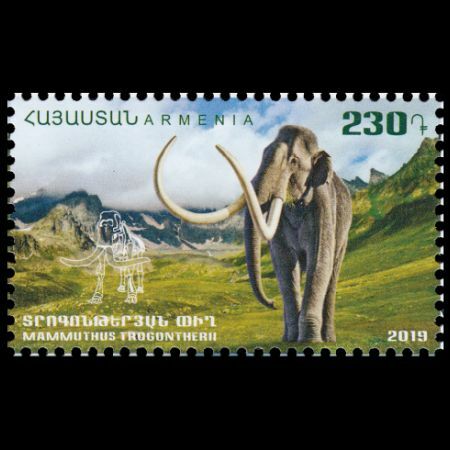 Armenia 2019 "Flora and fauna of the ancient world (III): Mammuthus Trogontherii"
On March 27, 2019 Post Authority of Armenia issued third stamp in their multi year set "Flora and Fauna of Ancient word". 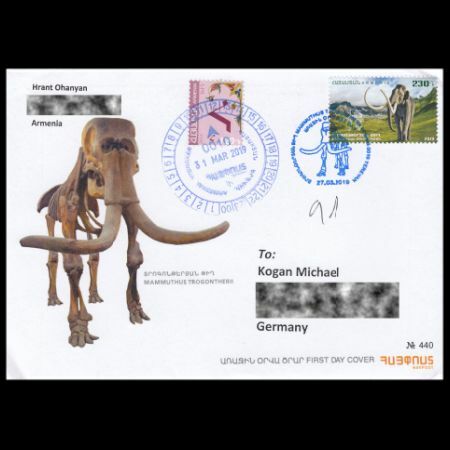 This time a local prehistoric animal Mammuthus Trogontherii depicted on the stamp. 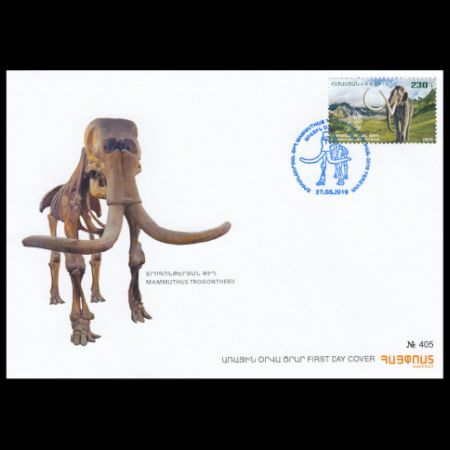 The left part of the postage stamp depicts its restored skeleton, kept in the Geological Museum and discovered in Shirak region in 1927. The length of the skeleton is 4,5 meters and the height is 3,5 meters. 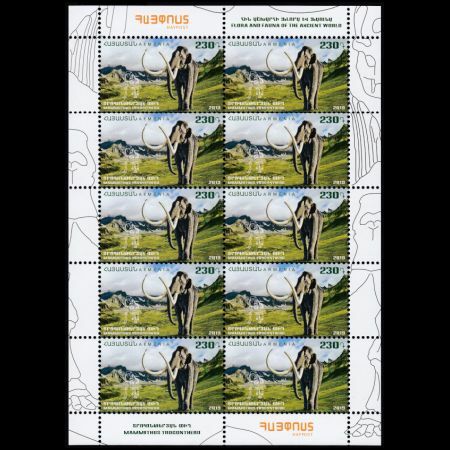 The postage stamp was cancelled by First Deputy Minister of Nature Protection of Armenia Irina Khaplanyan, Deputy Minister of Transport, Communication and Information Technologies Armen Arzumanyan, Chairman of the Board of HayPost CJSC Juan Pablo Gechidjian, President of the Union of Philatelists of Armenia Hovik Musayelyan, Director of the Institute of Geological Sciences Khachatur Meliksetyan. 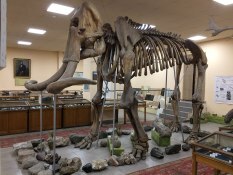 Mammuthus Trogontherii, also known as Steppe mammoth, is extinct animal that leaved over most of northern Eurasia between 600,00 and 370,00 years ago. It was the first stage in the evolution of the steppe and tundra elephants and an ancestor of the woolly mammoth of later glacial periods. 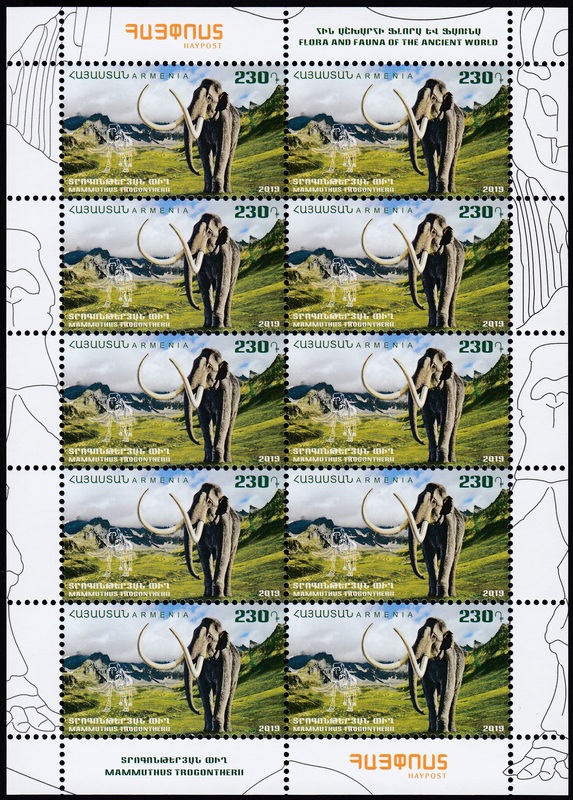 Mammuthus trogontherii is generally regarded as the largest species of mammoth. 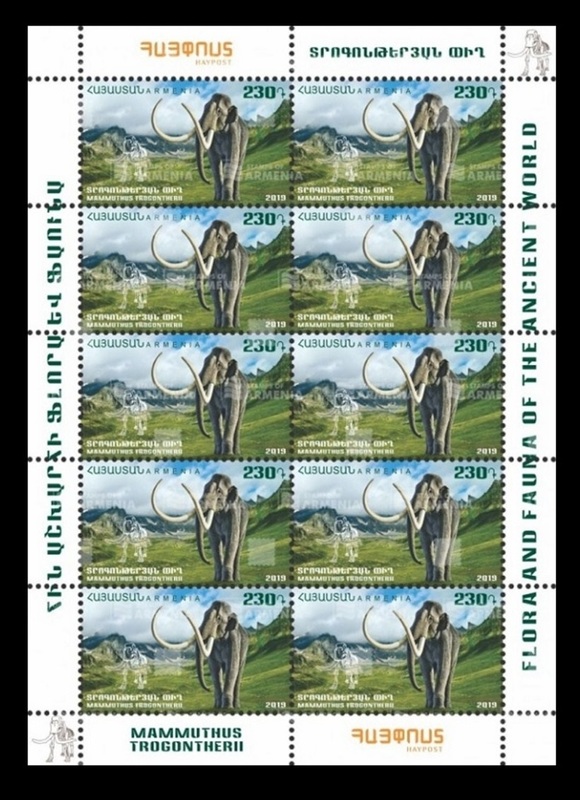 Like with others of its kind,‭ ‬the steppe mammoth had large broad teeth that were perfect for grinding large amounts of grasses that would have been required to keep its massive body going.‭ ‬The tusks of the steppe mammoth could grow as long as five hundred and twenty centimetres,‭ ‬although these tusks were strongly curved and as a result would not project out for this distance. The mammoth is the biggest and most attractive fossil of Geological Museum after H. Karapetyan of Institute of Geological Sciences of the National Academy of Sciences of the Republic of Armenia and depicted on its logo. Commemorative postmark of FDC cover looks like the logo of the museum. .